Acne is a common skin condition that affects the face, neck, chest, upper arms, buttocks, and back. These are the areas that have the most oil glands. 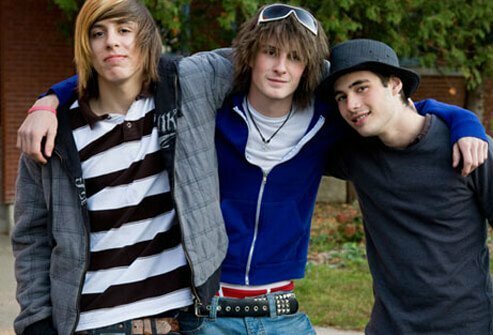 Teenagers are the group most affected by acne, but it can happen to anyone of any age. Men, women, children, older adults, and even babies can get acne. Blackheads and whiteheads are two types of acne. When inflammation goes deep into the skin, cysts or nodules may develop. Acne is a common beauty concern for women who have fluctuating hormones. Clear skin is possible for everyone if you follow a basic good skincare routine for your unique skin type. Harsh scrubs and products that have harsh chemicals like alcohol can dry and irritate skin. Ultimately, they can make skin conditions worse. Use gentle products on your skin. Choose alcohol-free cleansers. Do not use water that is too hot or too cold. Lukewarm water or warm water is best for cleansing facial skin. Do not scrub skin. You may spread bacteria that contribute to acne. Red, irritated skin may also make acne appear worse. Use cleansers that are specially formulated for your skin type to boost the chances of a clear complexion. Exfoliate gently with a washcloth and choose products that encourage skin cells to turn over. When cleansing skin, it’s important not to use ingredients that can clog pores. Make sure the products you choose are labeled oil-free. Look for labels that say nonacnegenic or noncomedogenic. These are dermatology terms that mean the products will not clog pores and contribute to acne. Products containing benzoyl peroxide or salicylic acid are proven to help clear up acne and prevent future breakouts. Use a soft washcloth to wash your face. A baby washcloth is a good choice because it won’t irritate skin. Some people think eating sweets cause acne. There may be some truth to that thinking. 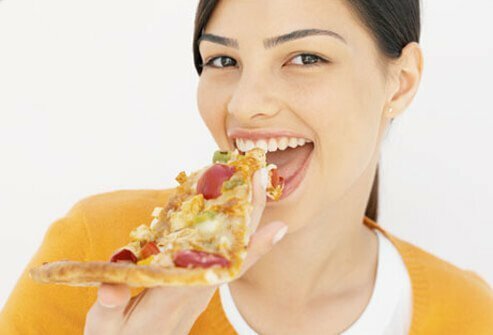 There is some evidence that eating foods that have a high glycemic index contributes to acne by altering the levels of hormones that increase inflammation and oil production in the skin. High glycemic foods cause bigger increases in blood sugar over a shorter period of time compared to low glycemic foods. Examples of high glycemic foods include white bread and potatoes. Low glycemic foods include lentils, legumes, and non-starchy vegetables. Ask your doctor if your diet may be contributing to acne. You know you should avoid face wash that contains oil and other harsh chemicals, and the same rules apply to cosmetics. Avoid cream foundation and products that contain oil. Choose mineral-based foundation and makeup instead. These products may be loose or pressed, but they are lighter than cream-based products. Read the labels and choose “noncomedogenic” products that won’t clog pores. Toiletries and sunscreen should also be noncomedogenic. If you are prone to breakouts, make sure the products you use on your face are oil-free and noncomedogenic. Dermatologists recommend washing your face every night before you go to sleep. Do not sleep in your makeup. It may also provoke breakouts. Your beauty routine should include washing your facial skin every night before bed. Give your skin the chance to breathe while you sleep and apply a moisturizer that nourishes and hydrates skin at night. A common myth states that sunbathing clears up skin. This is not true. Excess UV sun exposure increases the risk of skin cancer, wrinkles, and premature aging. Do not sunbathe excessively or use tanning beds. Using tanning beds increases the risk of melanoma by 75%. Melanoma is the deadliest skin cancer. 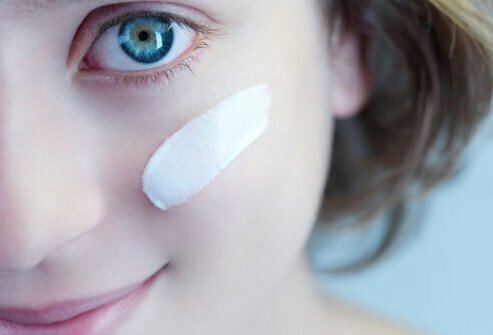 Be especially careful with UV exposure if your doctor has prescribed retinoids or other types acne medication for you. These drugs increase your sensitivity to sun and tanning beds. You skin may burn much faster if you are on these medications. Spend time outdoors safely. Wear sunscreen, a wide-brimmed hat, sunglasses, and protective clothing for flawless skin. Most anti-aging skin tips include warnings about excess sun exposure leading to premature aging. Use broad-spectrum sunscreen that protects against both damaging UVA and UVB rays from the sun. 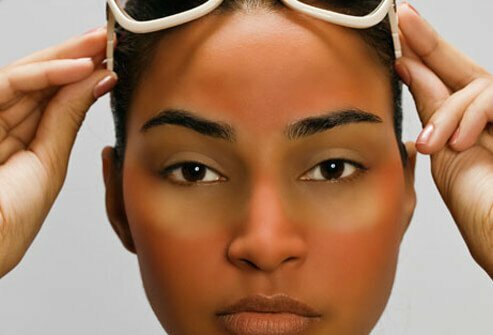 Apply sunscreen on the areas of your skin that will be exposed to the sun about 15 minutes before you go outside. Most people do not use enough sunscreen. You need approximately the amount of sunscreen that would fit in a shot glass to cover your entire body. You need to reapply sunscreen approximately every 2 hours when you are outside and every time after you get out of the water. Protect yourself from the sun for healthy skin. If you have oily, greasy hair, wash it daily to reduce the risk of pimples. Products like hairspray and gel can clog pores. Shield your face when you apply hair products to ensure none of it gets on your face. Conditioner may cause problems, too. Wash your face, neck, chest, and back after shampooing and washing your hair to remove any hair product that may clog pores and contribute to breakouts. Natural oils on hair may clog pores and trigger breakouts. Wash your hair daily if you are prone to oily hair. Use products that are formulated for oily hair and do not contain oil. If you have long hair, wear it up in a ponytail, braid, or bun, to keep it off your face, neck, chest, and back. Opt for a short haircut if you do not want to manage long hair. Wear a headband to keep hair off of your face. It is a bad habit to touch your face throughout the day. You may have bacteria, dirt, and oil on your hands. If you touch your face, you may transfer the contaminants to facial skin and it could trigger acne. Touching your face also facilitates the spread of bacteria that’s already on the skin to other areas. This can trigger new blemishes. Wash your hands frequently throughout the day. Keep hand sanitizer on hand for times when soap and water are not readily available. Keep your hands away from your face for clearer skin. 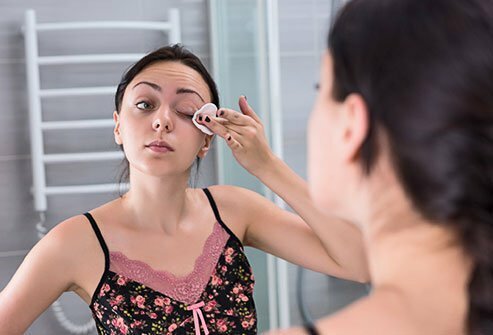 Practice good hygiene when applying makeup. Avoiding using your fingers to apply makeup. You could introduce bacteria into the product that can cause acne. Use disposable applicators, cotton swabs, or cotton balls to apply products. If you use brushes or sponges, clean them regularly and replace tools frequently. Makeup applicators can harbor oil, dirt, dead skin cells, and bacteria that contribute to acne. Wash your face before applying makeup so you start with a clean palette. If you have acne, you might be afraid to use moisturizer for fear of triggering new breakouts. The truth is that keeping your skin moisturized will help keep it healthy and blemish-free. Choose oil-free moisturizer that is labeled noncomedogenic. A good moisturizer hydrates and softens the skin and creates a barrier to prevent water loss from the skin’s surface. Moisturizers formulated for individuals prone to acne may also have ingredients with anti-inflammatory properties like aloe vera and witch hazel. Apply moisturizer twice a day after washing your face for best results. Add oil-free beauty products to your skincare regimen to get glowing skin. Resist the temptation to pop pimples or pick at acne. Doing so could force bacteria deeper into the skin and cause bigger lesions. You’ll also spread bacteria and increase the chances of new breakouts. Picking at your skin may lead to scarring. If you want smooth skin, don't pick! Clean and dry your skin and apply topical acne products and moisturizer. 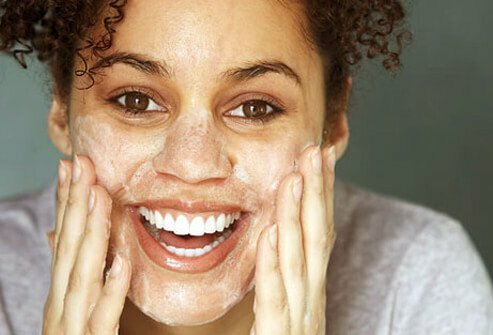 Follow your skin care routine to give yourself the best chance of clearing up your skin and preventing new breakouts. Successful treatment of acne doesn’t occur overnight. At-home treatment can take 4 to 8 weeks before you begin to see improvement. Severe acne may take even longer to start to clear up. If you are prone to acne, you may need to be on some kind of maintenance program even after blemishes clear up to prevent recurrence. It’s important to follow your doctor’s orders regarding treatment. Doing so will give you the best chance of success and clear skin. Acne treatment works, but it takes time. If you start with over-the-counter treatments and do not get relief, see your doctor. Several prescription topical and oral, systemic medications are available. You may need to undergo a bit of trial and error to figure out which treatments work best for you. Non-medication treatment options are available, too. Your dermatologist may treat acne using lasers, light therapy, or chemical peels. The doctor may treat cystic acne lesions with a procedure called drainage and extraction. American Academy of Dermatology: "Acne"
American Academy of Dermatology: "Acne: Diagnosis and Treatment"
American Academy of Dermatology: "Helping Stop Pimples"
The Journal of Clinical and Aesthetic Dermatology: "Moisturizers for Acne: What Are Their Constituents?"